To provide people in community living the opportunity and resources to lease their home or apartment, pay their own expenses, make their own decisions, and receive services that promote choice and self-sufficiency. To enable people with a greater variety and intensity of challenges, including physical and medical challenges to “age in place with dignity”, in their own homes. Making your own decisions, being independent, having a place to call home, and having a meaningful job are important to everyone. MacDonald Training Center has over 20 years of experience in providing Supported Living Services and Employment Services that can assist persons with disabilities in achieving these goals. Whether just a few hours a month of coaching is needed or 24-hour-a-day support, we customize our services to meet all needs. 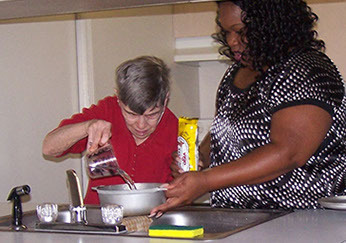 Our Community Services teams of experienced supported living coaches, supported employment coaches, and in-home support companions are ready, willing and able to assist the people we serve in realizing their dreams. Mary, seen in the photo, at home with her supported living coach, is one of the many people whose lives have been changed by MTC. Mary’s story is typical of many of the people we serve who are now senior citizens. As a baby with mental retardation given up at birth, her first fifty years were spent institutionalized. Since leaving the institution thirty years ago to come to MTC, Mary has been playing catch up. With appropriate services, she continues to advance, particularly in areas of communication, her greatest challenge. And while we know that her future needs will become more challenging, our commitment to Mary remains absolute. Despite the onslaught of state reductions and threats to Federal support, MTC is committed to making sure she ages with as much dignity and grace as possible, does not spend her old age warehoused and institutionalized. Her youth was forfeit, with MTC, her future is not.